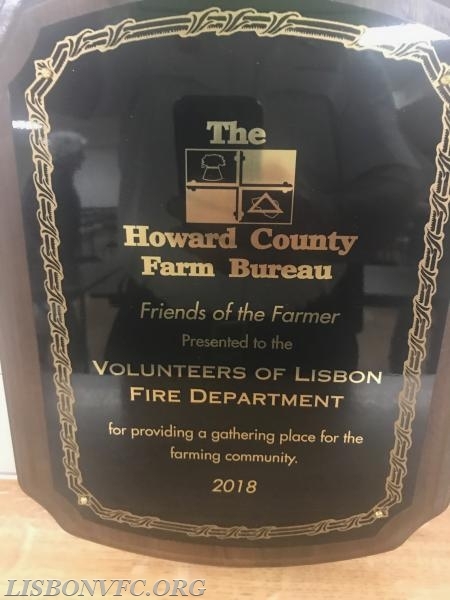 The members and officers of the Lisbon VFC would like to thank the members of the Howard County Farm Bureau for giving us their "Friends of the Farmers" award at their annual banquet held in our social hall on Thursday Night. As part of the award the Farm Bureau donated $1500 towards the Building Fund for the new firehouse. We were also presented with a $2000 donation from the Lisbon Christmas Parade Committee from the 2017 parade. We would like to thank all involved for their continued support of our department and building project.